The Ford Econoline E-350 van has been in production since the 1960s and was phased out in 2014. This practical van makes it easy to carry passengers or handle all of your business equipment. It makes a great vehicle for construction or plumbing. 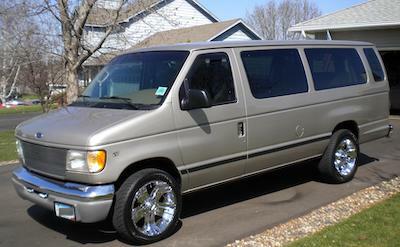 When you need to replace any of the parts on your van, you buy OEM Ford Econoline parts for exact fit parts that never need to be modified to fit. Radiators – The radiator holds all of the coolant your engine needs to run at the lowest possible temperature. A leaking radiator will cause the engine to overheat, which can damage the engine. We have radiators, hoses and thermostats. Floor Mats – The floor mats help preserve the carpet in your van, and that helps to keep the resale value up. We carry floor mats, armrests and other interior accessories. Shocks and Struts – The shocks and struts ensure that your ride is always smooth. A bad shock will cause you to feel every bump in the road. We have struts, shocks and axles. When you buy OEM Ford parts from us, you get the benefit of our experienced parts staff, so you can ask any questions about any Econoline E-350 parts. We offer fast, affordable shipping and wholesale pricing. Buy today.